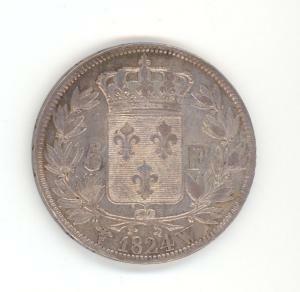 French silver five Franc piece of 1824. 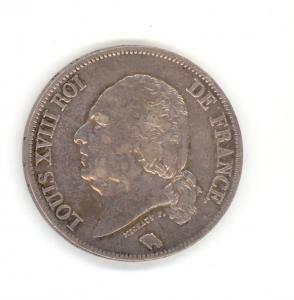 Obverse bears profile of Louis XVIII of France facing left. Border reads: "LOUIS XVIII ROI DE FRANCE". Edge reads: "DOMINE SALVUM FAC REGEM". Reverse bears a shield emblazoned with three fleur-de-lys and surmounted by a crown. A wreath encircles the whole. Within wreath: "5F" and below "1824" and assayer's or minter's mark and mint mark: "W".